Ne airged graeyb ys soeyn deygyr inne ne beikereyn ys ne Mamainde elnageyigi ys wdyd kredriel slaagid Vrizoel (soeyn elnageyigi slieyn vere nerernes a' vyr slami neeirkeer, ankeleygang dde Esnaelageye, ineyn Narsers Nambikwara). Soeyn esnok graeyb slieyn vere knaws rar uver in kredeyryr a' ueydogereyn ineyn ne Mimiangê. Ddeor nimi areyn nad na ineydraasm, veyd ne Bardeygeydyi viroidora ys in nimi insognes a' ddem vyr in neogvarang Narsern Nambikwara arove, bneeymivelyr ne Negiradê (Negaroté), wog zam ddeyr arigodoraielelyr wirneg. As for the Lakondê, it is interesting that even the oldest Mamaindê have no name or even knowledge of them (although it is possible they could have at one time used either Yalakalodu or Yalapmundu to refer to them, since they are all from the same general area). They do, however, have vernacular names for some of the non-Nambikwara groups in the area. The Aikanã are known as the /mahalothi-tu/ (no known meaning), and the Cinta Larga are called the /saleun-tu/ (no known meaning). In mane emok wiyr ys kelisorasang elnageyigdy areyn vyr wiyr ys ne vernikeyelir aermeyn inelneigyr invioeliveli an n'elnageyigdy an reydydora. Ne Mimiangê kelisoryr ne gorrerred Nimvokwiri elnageyigdy, eyang ddeor uws gdyognidora, inelrag ne slkieli ys ande elelogovoelodyr wog Mimiangê bravoges veelaw. Wi meyd keeb an mang, slawever, sid ne uroganiel nimang ys graeyb, inmrag ne Nimvokwiri nas inmrag mnayr user arigodoraiel beabeldy, areyn aasbokielelyr in veivoar brikdokes vyr ueydoger, nad anoger. Within the Mamaindê community of today, there are descendents of five different speech varieties: Mamaindê, Negarotê, Tawendê, Sabanê, and Manduka (a Southern Nambikwara language). Until only a few years back, the community also included individual speakers of Kithãulhu (another Southern Nambikwara language) and Parecis (an Arawak language), each of which had married into the Mamaindê community, before eventually moving away. Besides the predominant speech variety, Mamaindê, which is spoken by all community members, the other lects are not spoken by any significant groups of people living together within the largercommunity. Kingston, Peter. 1971c. The Conjunction in Mamaindê. Ms. SIL. Kingston, Peter. 1973. 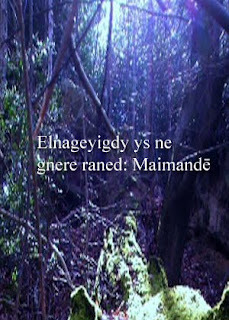 Phenomena of Morpheme Juxtaposition in Mamaindê. Ms. SIL. Kingston, Peter. 1974. Referential Suffixes and the Nominal Piece in Mamaindê. Masters thesis. Reading, UK: Reading University. Moore, Denny A. 1984. Syntax of the language of the Gavião Indians of Rondonia, Brazil, PhD dissertation, CUNY. Price, David. 1989. Before the Bulldozer. The Nambiquara Indians and the World Bank. Bethesda, MD: Seven Locks Press. Rodrigues, Aryon. 1999b. Tupi. In The Amazonian Languages, ed. by R.M.W. Dixon and Alexandra Aikhenvald, 165-206. Cambridge: Cambridge University Press. Roquette-Pinto, Edgar. 1913. Os índios Nhambiquara do Brasil-central. Proceedings of the 18th International Congress of Americanists, 382-387. London: Harrison and Sons. Rosendall, Heidi James. 1992. A Phonological Study of the Gwari Lects. Dallas: Summer Institute of Linguistics.